Building off of the momentum of past successful workshops, Edgar Perez is bringing Cybersecurity Boardroom Workshop 2015, seminar specifically designed for board members, senior executives and entrepreneurial business professionals looking for new ways to gain and maintain competitive business advantage in one of the most critical subjects for corporations and governments worldwide. New York City, NY, USA (April 23, 2015) — The U.S. Commodity Futures Trading Commission (CFTC) yesterday announced the unsealing of a civil enforcement action against UK resident Navinder Singh Sarao. The CFTC complaint charges Sarao with “unlawfully manipulating, attempting to manipulate, and spoofing” the E-mini S&P 500. The complaint had been filed under seal on April 17, 2015 and kept sealed until yesterday’s arrest of Sarao by British authorities acting at the request of the U.S. Department of Justice. • Shall we believe that a single low-tech trader living in a leafy street of a London suburb contributed in any significant way to the Flash Crash? • Why would the authorities rush to charge Sarao for the biggest financial markets breakdown just before the statute of limitations is expiring? • Why would professional traders fall for the rudimentary and well-known strategies employed by this individual and let him pocket millions? • Would this trader be the only market participant who engaged in this type of strategies during the “relevant period”? • Why is the U.S. Securities and Exchange Commission not joining the CFTC in this action after authoring a joint report about the Flash Crash? • Was Waddell & Reed behind the unnamed whistleblower in an effort to clean its name and enhance its reputation? • Why did regulators have to rely on a whistleblower to build the case having had the opportunity to pinpoint this behavior five years ago? • Is Waddell & Reed getting ready to sue the CFTC and SEC for hundreds of millions of dollars in lost business and defamation? • Why would regulators let Sarao operate in the markets and engage in similar trading strategies as in the Flash Crash eight more times? • Wasn’t one Flash Crash enough to better police the markets and stop Sarao for good? Mr. Perez is bringing Cybersecurity Boardroom Workshop 2015 to Dubai, Hong Kong, Seoul, Singapore, London and New York City. Members of the board, senior executives and entrepreneurial business professionals of public and private firms looking for new ways to gain and maintain competitive business advantage will congregate in each of these cities for inspiring 2-day sessions these upcoming months of April and May. 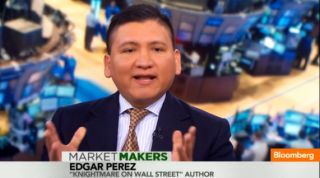 Mr. Perez is a published author, business consultant for billion-dollar private equity and hedge funds and Council Member at the Gerson Lehrman Group, with subject matter expertise in cybersecurity, investing, trading, financial regulation (Dodd-Frank Act) and market structure. Mr. Perez has presented his workshops in cities around the world, including Hong Kong, Sao Paulo, Seoul, Kuala Lumpur, Warsaw, Kiev, New York, Singapore, Beijing and Shanghai. He contributes to The New York Times and China’s International Finance News and Sina Finance. Cybersecurity Boardroom Workshop 2015 (http://www.cybersecurityboardroomworkshop.com) is a must-attend forum for board members, CEOs, CFOs, COOs and executive managers who need to become more educated about cyber security in order to ask questions that are strategic yet granular enough to address company specifics. Cybersecurity Boardroom Workshop 2015 is targeted at corporate decision-makers for whom cybersecurity readiness is a relatively new yet critically important area to be intelligently conversant about. Adobe, ADP, E*Trade, Fidelity, Home Depot, JPMorgan Chase, Nasdaq, Neiman Marcus, Sony, Target and Wal-mart are just a few of the large companies that have suffered high-profile cyber security breaches. Cybersecurity Boardroom Workshop 2015 is specifically designed for boards of directors and senior executives of public and private firms looking for new ways to gain and maintain their competitive advantages. Business executives with responsibility for IT, finance, compliance, risk management and procurement as well as entrepreneurs and innovators are welcome to add their points of view to the debate. This entry was posted in Business, Finance, Investment, Press Releases and tagged cftc, cybersecurity workshop, edgar perez, flash crash, hft, navinder singh sarao, the speed traders. Bookmark the permalink.